Not long after I published my list of what kinds of works should receive the Geeking Out About… seal of approval for celebrating inclusivity and diversity, I read a notice on the message board for this podcast that it was going to be going to be ending this year. This prompted me to fire off an email to Paul Saunders asking him if I could include the podcast as one of my platform planks because even though I was an infrequent listener (due to my not having read or seen all of the works they were reviewing), I really enjoyed the premise of the podcast and what it was attempting to achieve. His response was to be flattered but wonder if they were even eligible, something about which I was quick to reassure them. And yet, I am totally not surprised to know that was the first reaction from him, seeing as he is a member of my favorite Internet sketch comedy troupe Loading Ready Run. 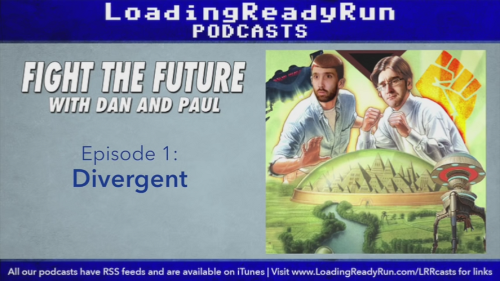 Canadian brothers Dan Saunders and Paul Saunders (and their guests) first introduce, then recap the entire plot of a young adult dystopian science fiction movie or book as objectively as they can, perhaps with some comedic asides. Next, they discuss the plausibility of the worldbuilding as well as how scary the world is for its fictional characters. There’s a section where they talk about what kind of characters they would be in the fictional world, and then using either clues left by the creators or information from official sequels, they talk about what hope there is for the characters in the fictional world beyond the end of the book or movie. Finally, there’s either a snippet of a scene from the movie or a song which they feel illustrates the work the best, and a final summary from the hosts before the sign-off. There are many podcasts out there which are dedicated to reviewing books and movies from a critics’ perspective. However, I believe this is one of the first podcasts I’ve heard of which reviews the actual worlds in which the books or movies take place. Of all the episodes I’ve heard, there are very few instances in which I feel that either Dan or Paul or their guests know or care too much about the current science fiction/fantasy literary blogosphere’s opinions of the works, its creators, its production team, or the actors portraying the characters. They are just there to discuss the work and only the work. When they do bring in references to other works or the greater outside world, they do it either near the beginning or near the end so that the discussion of most of the episode is focused on just the world inside the movie or book. It’s both fan discussion and literary criticism in its purest form, where the only clues you have are the work itself, the world you currently inhabit, your personal experiences, and that’s it. From the very first episode, I loved this premise and found myself wanting to join in on the discussion in either the forum threads or the comments on the YouTube version of the podcasts. (It’s also available on iTunes and well as having its own RSS feed as well.) They are never mean or cruel when they point out major flaws, which is very much in keeping with the whole Loading Ready Run ethos which I love. They’re also not slavish in their approval or disapproval, which I really appreciate. I even love the original theme song, composed by Bradley Rains. As I begin to evaluate works for my platform, I’m starting to realize that just like the Bechdel or the Mako Mori test, just because a work can stand on my platform on a superficial level, it doesn’t mean that the work is a perfect example of a truly diverse work. In my email correspondence with him, Paul Saunders admitted that the podcast isn’t very diverse. “We have tried to get as many different special guests with different points of view as possible,” he wrote in an email, “but obviously the pool of people in our social circles that are available and have an interest in the topic is not that big.” My reaction to that is a hope that for any future podcast they do, he and/or Dan are able to reach out to members of the YA dystopia fiction community at large who can recommend more works by non-Caucasian, cisgendered Canadian authors and/or filmmakers or more guests who aren’t from just North America. At last year’s CONvergence, the theme was all about dystopian futures. While at a MetaFilter meetup, I mentioned Fight the Future to a person I was meeting in person for the first time and extolled its virtues. Months later, she asked me about the podcast because clearly the idea of it was something that had stuck in her mind after all that time. Fight the Future is a podcast which was sadly limited in its length and lasted for only a year, but should be pointed out as one of the best productions of 2015. That’s why I’m nominating it for a Hugo Award this year and next year, and I hope that many of you agree.